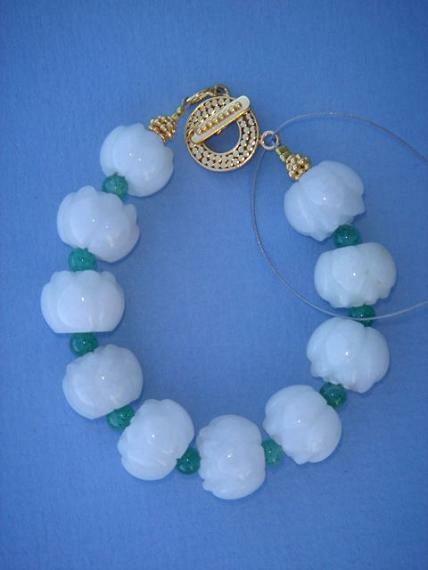 I have made these beautiful white 15 mm jade beads into a bracelet. The jade beads are carved in the shape of a lotus and are interspersed with small green aventurine beads. I have rarely found jade beds this beautiful shape. The bracelet is 8” long and fits a 6” to 7” wrist. It is finished with a 18k gold vermeil toggle clasp. This is a one of a kind bracelet. The lotus, also known as the sea rose, is a symbol of purity, fruitfulness and creativity.